Researchers are hoping to learn from the way that bats and dolphins use their sonar in crowded and busy environments how to improve human technologies that face similar challenges. Self-driving cars, robotic vacuums, and Navy sonar technology all use a form of active-sensing designed to mimic what animals like bats and dolphins do when they echolocate, to build a picture of the world they're in using this technology. However when there is more than one of these devices in an environment, the pings they send out, and echoes that ricochet back can interfere with each other. This can lead to confusion because the machines can't tell their own sensor signals from those sent out by others. According to new research bats and dolphins have evolved an elegant solution to this problem. "These animals can do something that we humans think is an impossible task. And this impossible task is using their or using their active sensing when they're in really complicated environments. And what's really impressive is that despite all of the technology and all of the science, we still haven't been able to create a device that is as good at echolocating as bats and dolphins are," said Laura Kloepper, an assistant professor of biology at Saint Mary's College in Notre Dame, Indiana. "If you start putting multiple units together, multiple items that are using active sensing in big groups, that's when we start having a problem of interference — whether it is sound, or light, or radio waves, how do we avoid the problem of all of these signals jamming in space — or air or water — and causing an interference and a failure of the system?" Kloepper studied this problem in dolphins in captivity and in bats in the wild. To study the dolphins, she'd play high-frequency audio pings to a single dolphin at a time and adjust the position of the speaker to find out what the dolphins would do to get around this interfering signal. 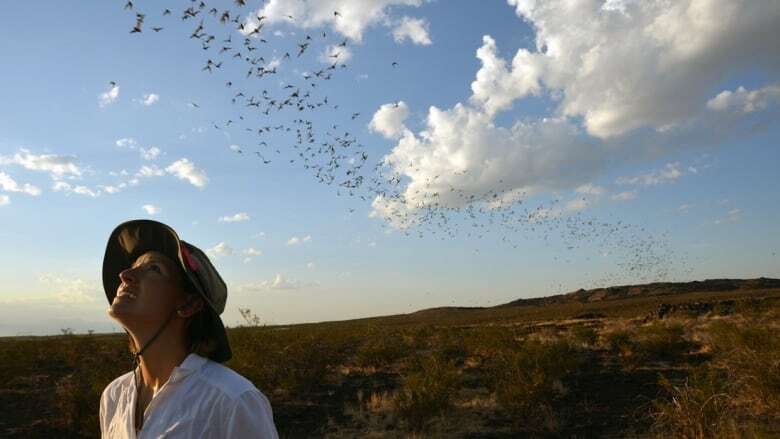 Researchers have done similar studies with bats in labs, but for her bat research Kloepper wanted to get into a natural bat swarm that occurs in the wild. To do this, she's developed three different mobile recording technologies to get audio and video recordings of the echolocating bats. The first setup she devised was a zipline that could carry her mobile recording device into a swarm. The second setup used a drone with the recording gear placed on it to get in the middle of a swarm. The third setup, a favourite of her students, is a hawk they've trained to fly in the middle of the bat swarms while it's equipped with the recording gear. Interestingly, bats and dolphins utlitize the same methods to get around echolocating interference in groups. Kloepper found the key their ability to get around interfering signals is they adjust the frequency to become higher or lower pitched — to differentiate between their echolocating calls — as well as adjusting the timing of their audio pings. "Bats and dolphins are a classic example of what we call convergent evolution and that is when you have two unrelated organisms that have the same evolutionary pressures and have evolved the same adaptation to counter those pressures in their environment," said Kloepper . She says to solve this problem in technology, perhaps engineers and software designers could develop this technology to using a similar strategy. "So if you have different active sensing — if they're using sound, using the same bandwidth, you shift the bandwidth away, so that each one can have its own frequency range that it's responding on. Or you can shift the timing."